What do you do when your family has taste preferences like these? You make a recipe that includes all of the above and make them eat crow, that's what you do. I'm not gonna lie. I was nervous. I was pretty positive no one in my family would eat it, especially considering the last recipe I made that called for beans and no meat was so awful even I couldn't choke it down. 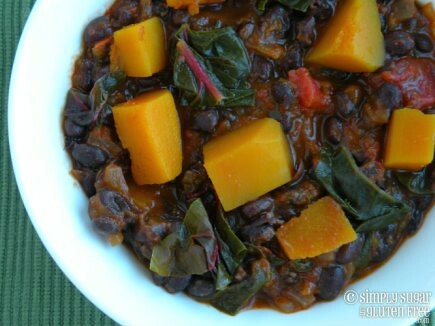 This Black Bean-Butternut Squash-Swiss Chard Veggie Chili from Amy @ Simply Sugar and Gluten Free was out of this world! I was completely, and pleasantly, surprised by how comforting and filling it was. The flavors blended perfectly so there were no complaints about the "squash" taste, and I love that it incorporates a good hearty green like chard. The only change I made to the recipe was a little sprinkle of parmesan cheese on each bowl. It got an enthusiastic thumbs up from my easy-to-please eaters. Greyson had two helpings. He recommends having a bean on your spoon with each bite and then you can't even taste the squash. And it got a halfhearted thumbs up from the pickiest eater in the family, which is equivalent to anyone else jumping up and down. Jarrod even took leftovers to work today for lunch. That man hates leftovers. SO, if you are looking for a fab new veggie chili recipe for the winter, give this one a try. I'd never even considered what gluten-free/sugar free eating could be like, and then one day I stumbled across a guest post of Amy's at Kitchen Stewardship. I've been following her ever since and I've really learned a lot. We don't have any medical reason to be gluten free, but she makes it look easy, do-able, and delicious. I'm sure going a little lighter on the gluten won't hurt us any. If you want more great recipes like this one, check out Amy's blog. YUM! I'm totally making that for dinner. Seriously, I am so motivated. GF living here I come!! !